Crouched in the shadowy depths of the ocean floor, camouflaged by an overhanging ledge, a crab uses his visual senses to detect prey venturing near the entrance to his hideaway. Although a crab's two primary eyes found on independently moving eye stalks are compound in nature, primitive simple eyes around his body help him monitor his environment in every direction. The compound eyes on a crab's eye stalks help him detect UV light in low light conditions more than a half mile below the surface of the ocean. Studies by Duke University show that the compound eyes help crabs pick up on bioluminescent colors of the plankton and other crustaceans that makes up their diet, as well as patterns in the shells of other crabs that help them tell potential mates from rivals. One of the most ancient members of the crab family, horseshoe crabs have primitive eyes spaced around their body. Two median eyes on top of his shell monitor visible light, and an endoparietal eye is sensitive to UV waves. 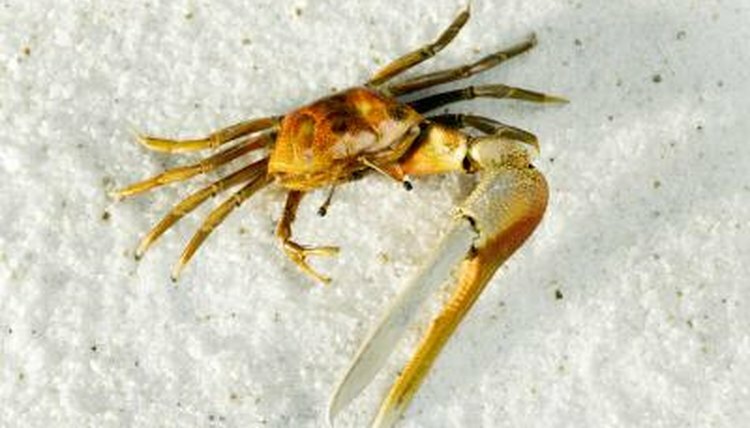 Ventral eyes on the bottom of the crab's shell help orient the animal in his environment and warn him of predators approaching from below. Additional light receptors line the horseshoe crab's tail to help him navigate low-light conditions in the ocean depths. The Horseshoe Crab: How Does the Horseshoe See?